Sir Patrick Moore, a British astronomer and popularizer of science, passed away on Sunday (Dec. 9). He was the host of the BBC's The Sky At Night," television's longest-running program. 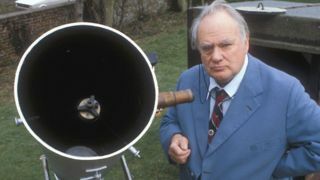 The famous British astronomer Sir Patrick Moore, who inspired a love of science in many through his BBC television program "The Sky At Night," died at age 89 on Sunday (Dec. 9). Moore "passed away peacefully"at his home in West Sussex, England, according to the BBC. His night-sky program, which began airing in 1957 and ran its last episode the night he died, is the longest-running television show of all time. Moore was also the author of more than 70 books on astronomy geared toward lay readers. Many scientists credit Moore and the show for inspiring them to pursue the careers they chose. "The first book on the cosmos I ever read was written by Sir Patrick Moore. May he rest in peace, somewhere in the universe," astronomer Neil deGrasse Tyson, director of the American Museum of Natural History's Hayden Planetarium, wrote on Twitter Sunday. "How many people bought their first telescope thanks to Patrick Moore?" British entrepreneur Sir Richard Branson, founder of the Virgin Galactic commercial spaceflight company, wrote on Twitter Sunday. "His passion, knowledge and humour made him truly unique," Branson added. Yet Moore was also a divisive person. He made misogynistic, anti-gay and anti-immigrant comments publicly, and alienated many whom he had inspired. "He was a controversial figure, beloved for his science promotion, but who also made comments that were pretty objectionable," astronomer Phil Plait, author of the blog "Bad Astronomy," wrote on Google Plus. "In my opinion, it is not only fair but also necessary to praise the achievements of the recently deceased as well as point out their flaws so that we may learn from them." Ultimately, Moore made an indelible mark on the world of astronomy. He was sometimes referred to as the "British Carl Sagan," though his reach spread far beyond the United Kingdom. "His passing away is a great loss," British Royal Astronomical Society president David Southwood said in a statement. "For my part, I first worked in a very junior capacity with Sir Patrick on the BBC coverage of the Apollo missions over 40 years ago. I was always inspired by his love of his subject and his professionalism in communicating it. First and foremost, he was a person with an apparently endless capacity to enthuse and inspire about astronomy, but there must be many that Patrick drew into working in science and technology in general. He'll be missed by millions."